Earlier today, Curator Corey Smith and Collections Officer Robin Bauer Kilgo from the Ah-Tah-Thi-Ki Museum on the Big Cypress Reservation dropped in on the Wolfsonian to meet with their counterparts, to share ideas about conservation and storage solutions, and to tour the museum galleries and storage spaces. Before leading them on a tour of the back stacks of our library, I pulled a few items from our collection that I thought might be of interest to them. Although Native American people and culture are not a particularly strong component of our collection, we did have a few items that caught their eye and which I will now share with you. The Wolfsonian library holds more than 11,000 vintage postcards documenting everything from World’s Fairs and international expositions, war propaganda, modernist architecture, and, of course, travel and tourism. 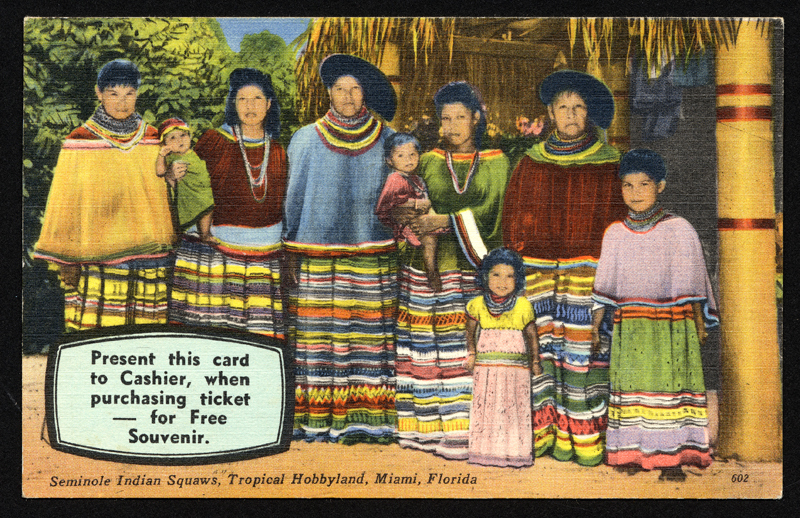 Among the local Florida postcards are a few that encouraged tourists to visit Miami’s “Tropical Hobbyland” located on the outskirts of a Seminole village. 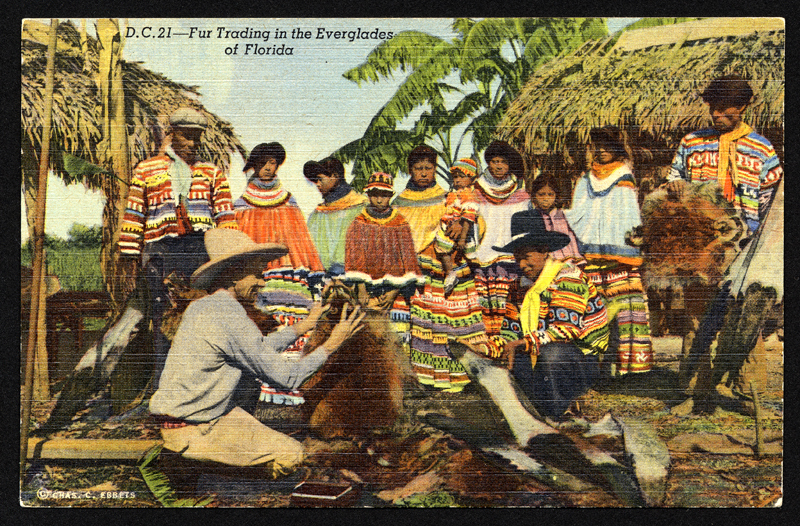 There visitors would have the opportunity to watch the native men wrestle alligators, and could buy from the women some “exotic” trinkets and souvenirs. 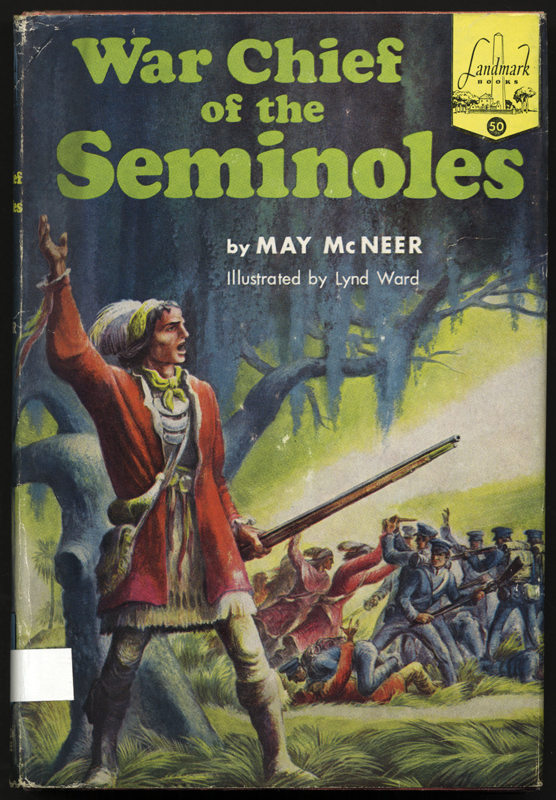 The library also holds a couple of books about Florida’s most famous war leader, Osceola. 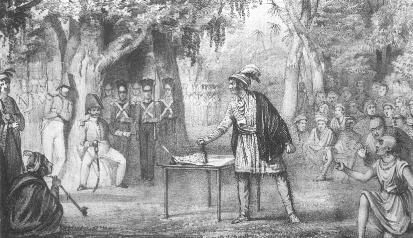 Although not a traditional chief, Osceola rose to prominence after he famously “signed” a land cession treaty with his knife. After recanting to secure his release, he led resistance-minded Seminoles in their fight for independence and against forcible removal from their homeland. The library originally collected these works less because of their content, but for the cover designs and illustrations by artists (such as Lynd Ward) important to our collection. 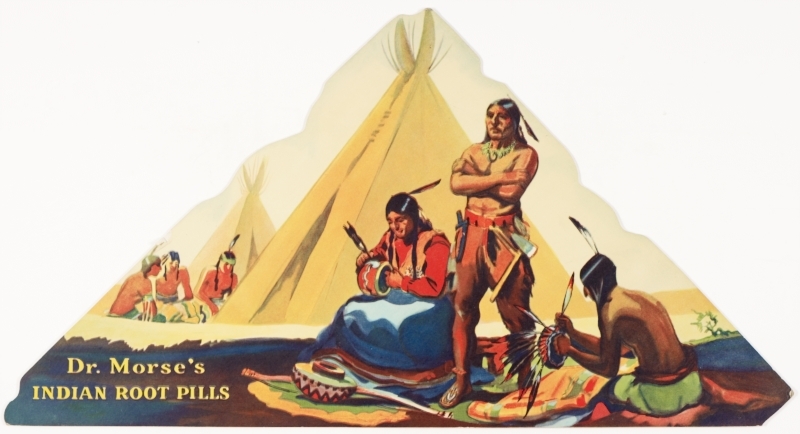 There are a significant number of ephemeral items in our collection that appropriated and used romanticized images of Native Americans as commercial propaganda for their products. Not too long ago we received in donation a large collection of pharmaceutical ephemera from William H. Helfand which included several large and beautiful display cards designed to advertise Dr. Morse’s Indian Root pills. 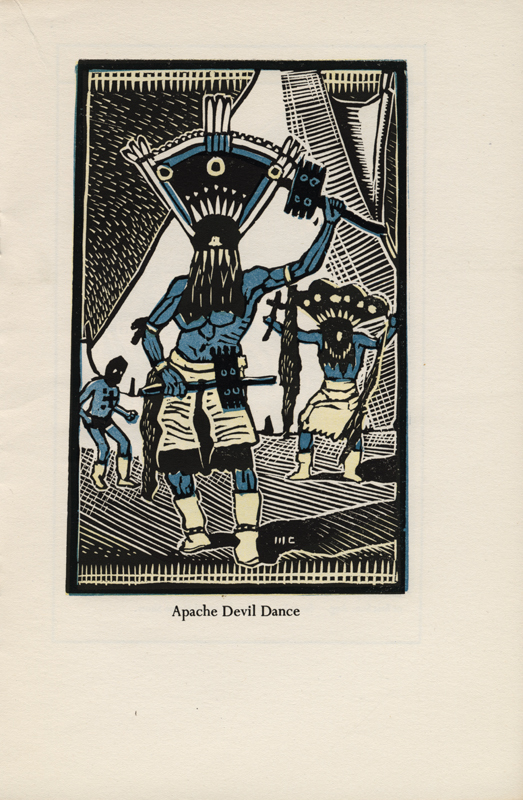 The Wolfsonian library does hold a significant body of works concerning Native American peoples during the 1930s. 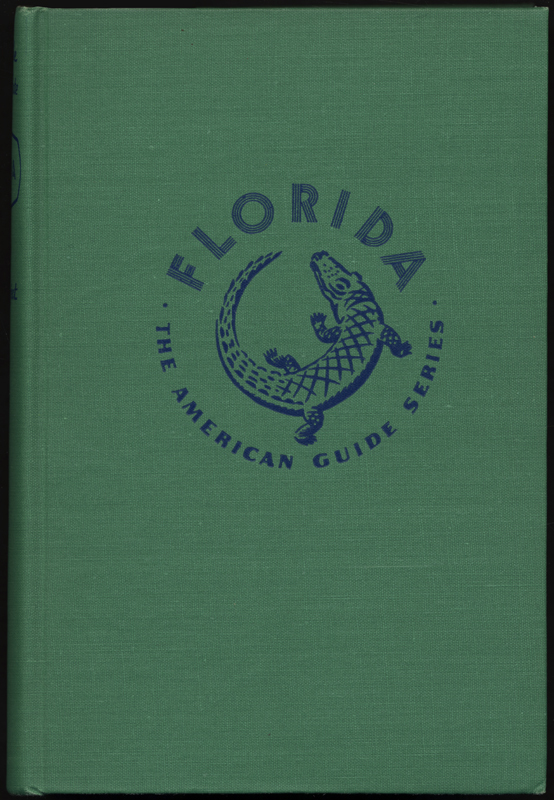 We have, for example, a couple of copies of Florida: A Guide to the Southernmost State compiled and written during the Great Depression by the Federal Writers’ Project of the Works Projects Administration. 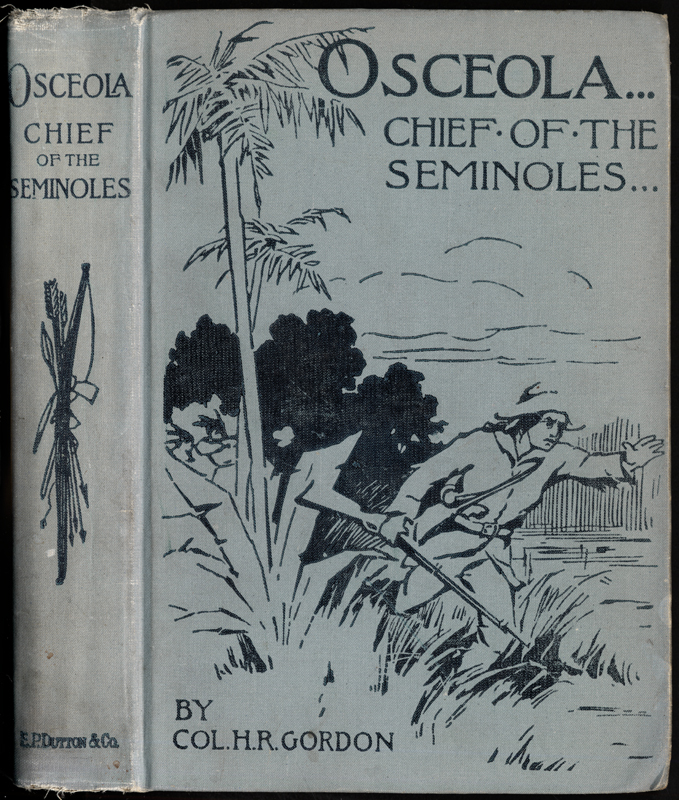 The guide featured some wood block vignettes of Indians made by Florida’s Federal Art Project administrator, Robert Delson, but also included images of Seminoles taken by the Farm Security Administration photographers. 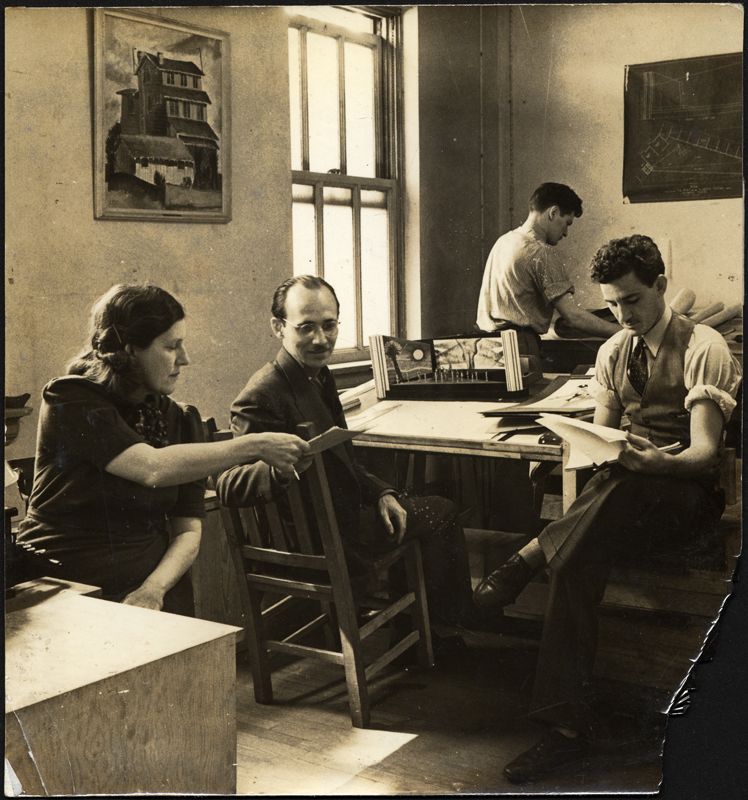 Thanks to a generous donation of his son, Sidney Delson, the library holds an archive that includes photographs of Robert Delson at work, images of his designs, and some of his official correspondence. 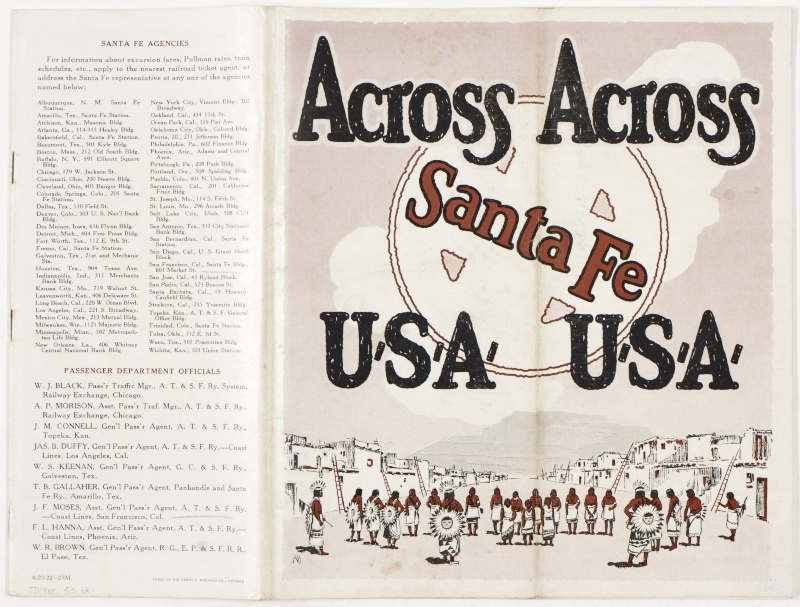 The library also has numerous other copies of the Federal Writers’ Project American guide series including the one designed for the state of New Mexico. 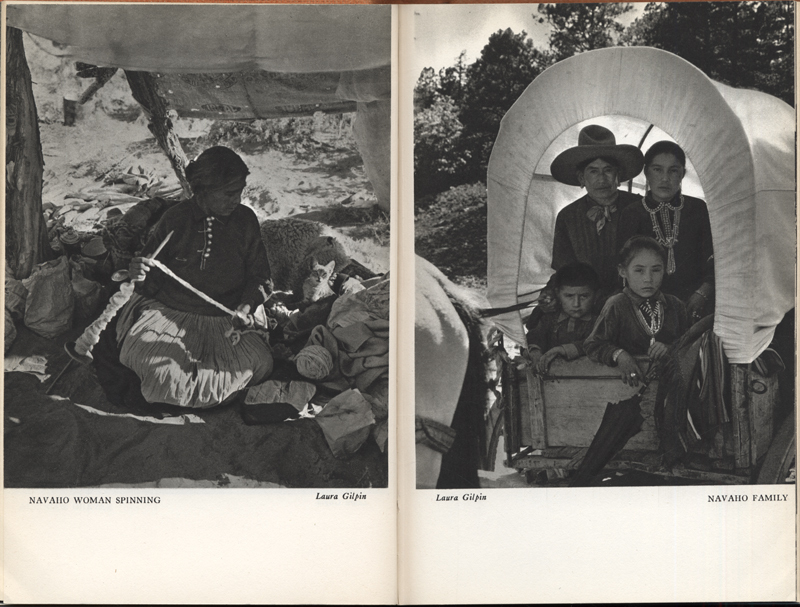 This state guide also featured Farm Security Administration photographs of Native people. 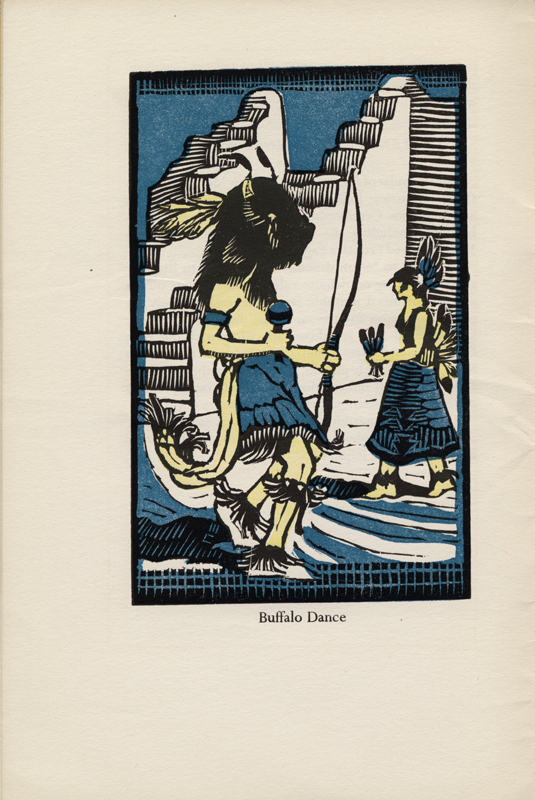 There are also a couple of copies in our collection of a calendar of events for 1937 compiled by the Federal Writers’ Project and illustrated by the Federal Arts Project of New Mexico. The illustrations for this calendar were printed from wood blocks designed and cut by Manville Chapman. When Franklin Delano Roosevelt became president in 1933, John Collier, Sr. was made Commissioner of the Bureau of Indian Affairs (or BIA). Within a year’s time federal legislation was passed that reversed many of the policies that had proved so detrimental to native peoples. Under Collier’s direction, the government instituted a New Deal for the Indian that recognized native rights to self-government, tribal sovereignty over communal lands and reservations, and encouraged their efforts at economic self-sufficiency. 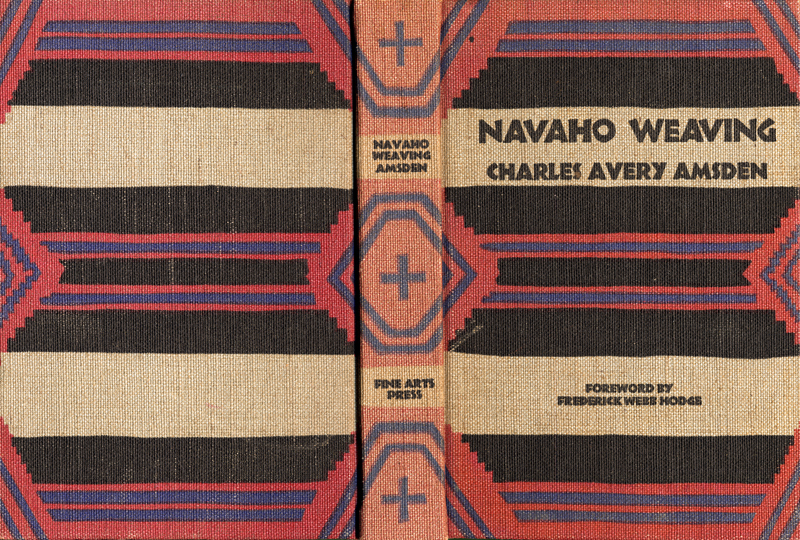 The library has a book on Navaho weaving, for example, bound in cloth designed to imitate the abstract native designs used in their rugs and carpets. The U. S. Office of Indian Affairs (O.I.A.) 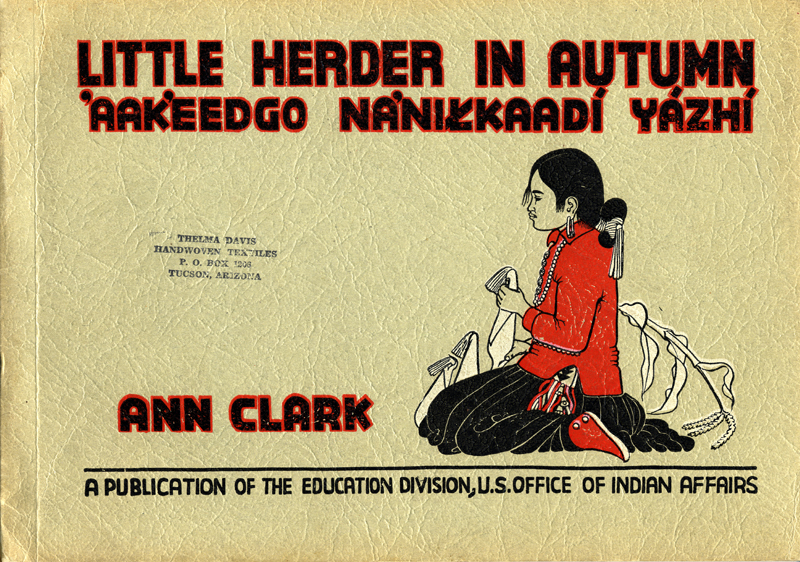 also published English-Navajo bilingual readers to teach them English even as it encouraged them to transcribe and retain their oral native language and practises. 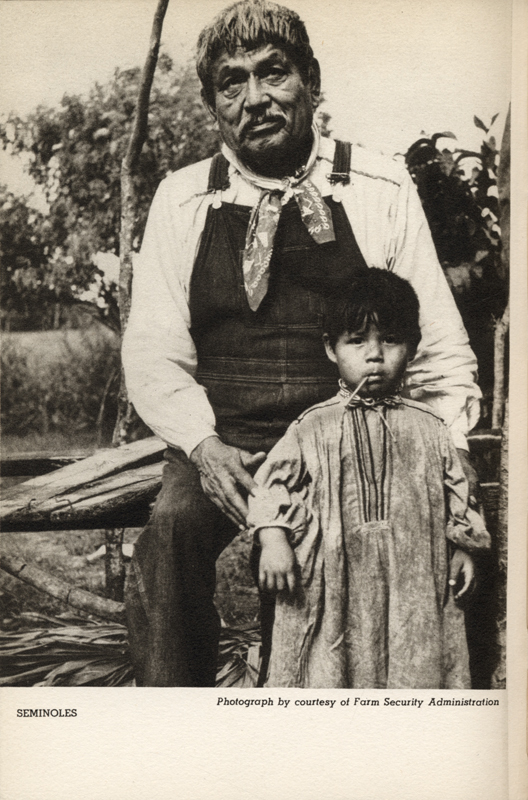 This was a far cry from previous policies that forcibly removed Native children from their parents’ custody, enrolled them in distant boarding schools, and punished the young students if they dared speak their native tongue or observed native customs. Two excellent films that have dealt with these deplorable policies are The Education of Little Tree (1997) and The Only Good Indian (2009). 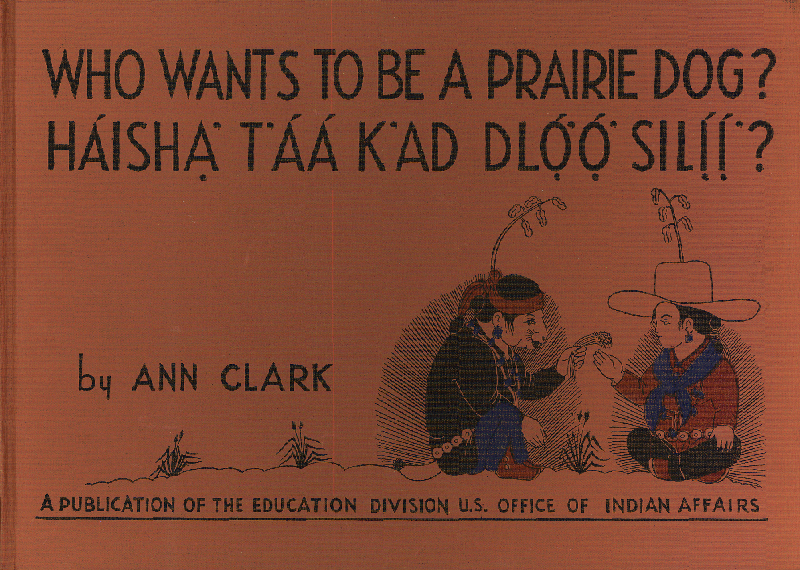 The Wolfsonian Library holds a complete set of the “Little Herder” series and the “Prairie Dog” readers published by the Educational Division of the O.I.A. 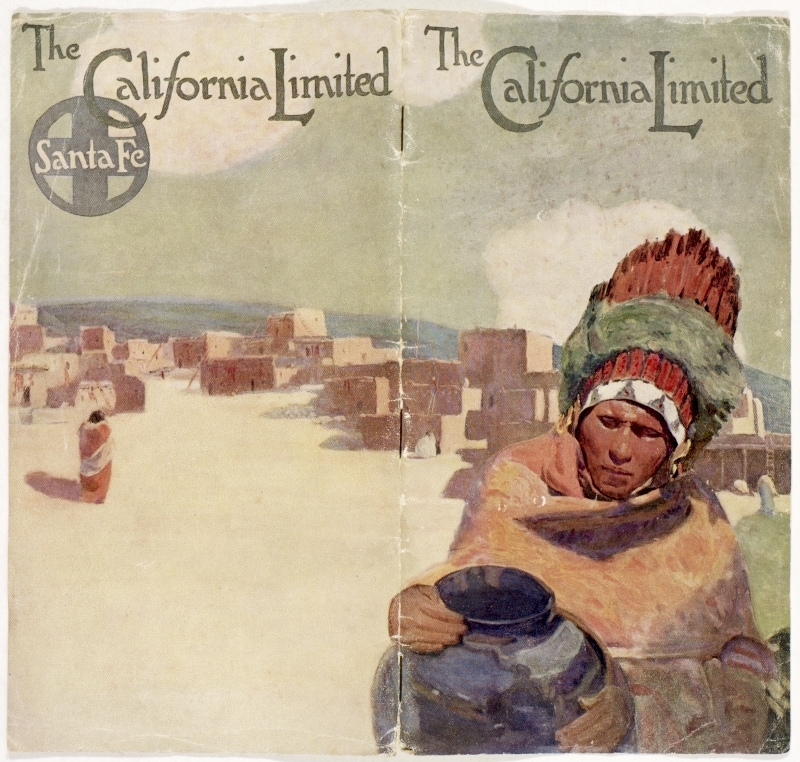 During this same period, even as the government tried to stimulate the domestic economy with a “See America” campaign, the railroad companies also tried to lure domestic tourists to their rail routes by emphasizing the “exoticism” of the native people of the Southwest and Northern Great Plains. 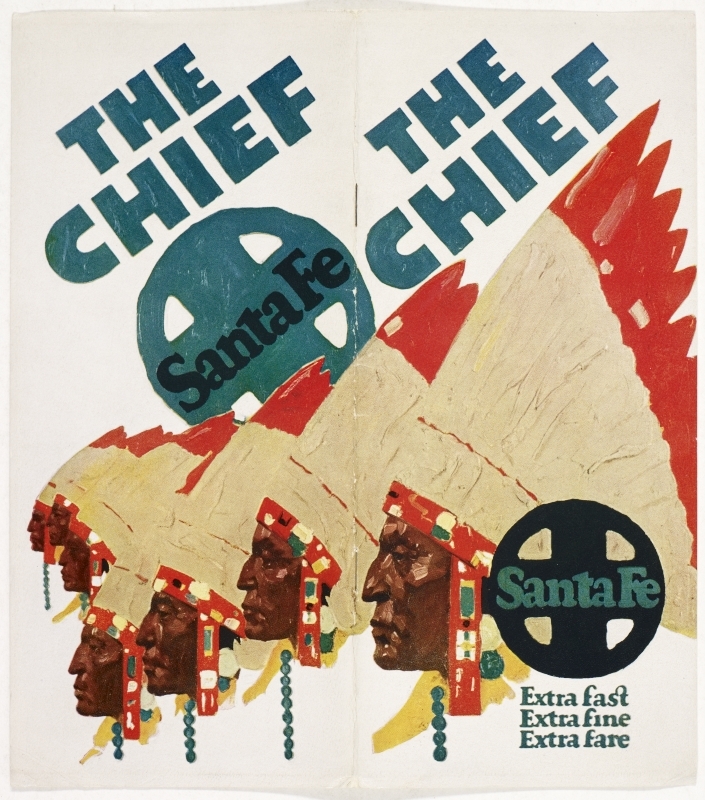 For decades the promoters of the Santa Fe line had used illustrations of Pueblo Indians on their advertising brochures. In the 1930s, the Great Northern railroad began to do the same with the Blackfeet Indians. In promoting the Empire Builder and the Northern route to Glacier Park, the Great Northern reproduced as calendar leaves some of the 250 portraits of Native Americans (primarily Blackfeet) originally painted by German-American artist Winold Reiss. Reiss had won recognition and some measure of fame for his sympathetic paintings of previously ignored ethnic groups in America. 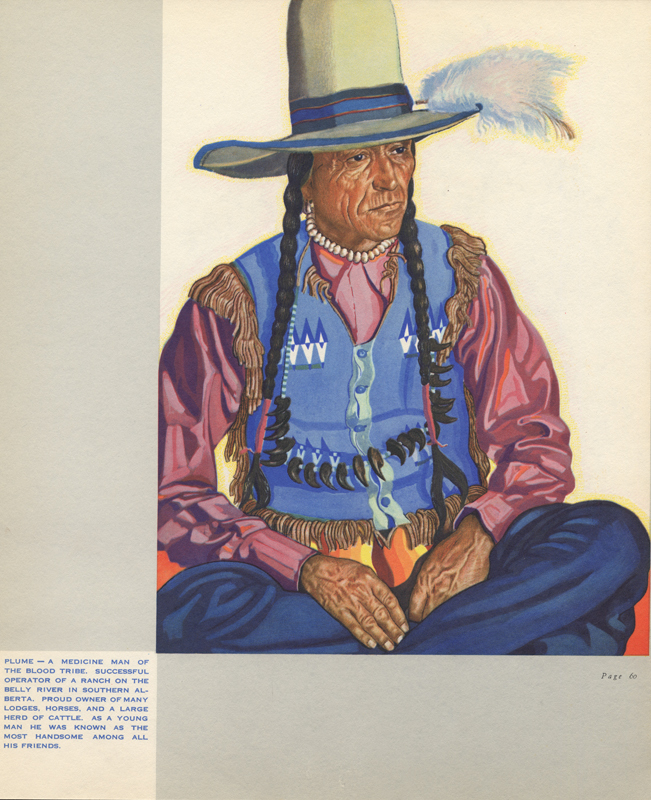 The library holds several copies of his book on the Blackfeet Indians and several of the calendars reproducing his portraits. ~ by "The Chief" on October 13, 2011.